Chris Gayle's unbeaten 99 went in vain as KXIP suffered their second successive defeat in IPL 2019. 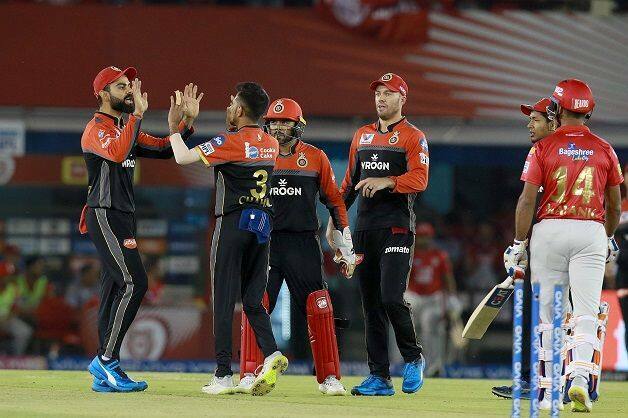 After the spin twins of Yuzvendra Chahal and Moeen Ali and pacer Navdeep Saini restricted Kings XI Punjab (KXIP) for 173/4, Virat Kohli scored 67 and AB de Villiers chipped in with an unbeaten 59 as Royal Challengers Bangalore (RCB) beat the home team by eight wickets in the 28th match of the Indian Premier League (IPL) 2019 at the Punjab Cricket Association IS Bindra Stadium in Mohali on Saturday and registered their first win of the season to end the six-match losing streak. Chasing 174, Parthiv Patel and Kohli provided RCB with a brisk start. 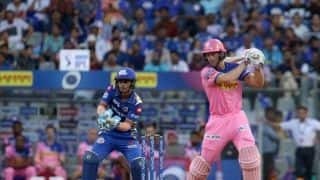 The dup put up a quickfire 43-run stand before the left-hander got out in the fourth over as he mistimed a R Ashwin delivery in the fourth over. Kohli was then joined by AB de Villiers and the two kept the scoreboard ticking without taking many undue risks. 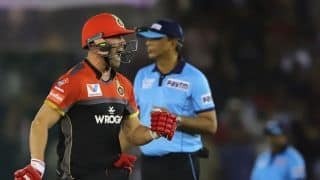 Kohli also brought up his second fifty of the season as he and the former South African skipper added 85 runs together before the RCB skipper was dismissed for 67 by Mohammed Shami. Earlier, after put in to bat, Chris Gayle was once again at the forefront as KXIP made up for a watchful start in the first four overs and brought up their fifty in the final over of the powerplay, with Mohammed Siraj conceding as many as 24 runs in his first over and the fifth over of the match. While Rahul looked to up the pace, Chahal got hum out stumped and followed it with a cracker of a delivery to end Mayank Agarwal’s innings. The West Indian, meanwhile, brought up his fifty as KXIP scored 90 off the first ten overs. However, even as their two pacers – Umesh Yadav and Siraj – leaked runs, Saini played his part, alongside the spinners, to stem the flow of runs and despite not taking a wicket, returned with the figures of 0/23 in his four overs. Gayle eventually fell short of his hundred by a run as he became only the second batsman after Suresh Raina to remain not out on 99 in IPL.